Nowitzki, the franchise’s career leading scorer in his 20th season, scored six points in the final quarter to help the Mavericks rally for their third win in 17 road games. Stephenson’s layup tied it at 94, but he committed a costly turnover on the Pacers’ next possession with 28 seconds remaining that the Mavericks converted into an uncontested layup. ”We just couldn’t get shots that we needed down the stretch to convert,” Collison said. Mavericks: Nowitzki is expected to make his 14,000th start Friday. He’s sixth on the career wins list at 886 and is 14 free throws behind Hall of Famer Jerry West for sixth on that list. … Ten of the Mavs’ 11 wins have come when they’ve limited an opponent to fewer than 100 points. 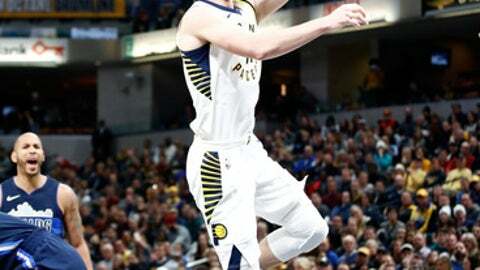 Pacers: The NBA leaders in 3-point percentage (.387) were 10-0 at home when hitting at least 10 3-pointers and 15-3 overall, but made 10 of 25 and lost. … Reserve forward Domantas Sabonis was questionable with a sore left big toe, but played in his normal rotation. … Reserve guard Joe Young sank two 3-pointers in the first half. He had made just two in 18 previous games this season. Oladipo missed his first game of the season to rest a sore right knee. The league’s eighth-leading scorer (24.9 ppg) scored a season-low 13 points in Tuesday’s 107-83 loss at Detroit. Oladipo had started each of the Pacers’ 33 games. Mavericks coach Rick Carlisle, who coached the Pacers for three seasons through 2006-07, needs two wins to tie John MacLeod for 17th place on the league’s career list. He has a record of 705-545, which includes 181-147 while with the Pacers. He won his 700th career game on Dec. 2.